Fox baby clothes are one of our favorite trends right now! This peppy little fox would love to meet your favorite baby boy! The fabric is a blue gingham. It’s lined in 100% cotton, and very comfortable. It looks cute alone, with a bodysuit, or with a collared shirt underneath. Choose to add a name or initials underneath the fox, or leave it plain. It has snaps at shoulders, and snaps at the legs for easy diaper changes. 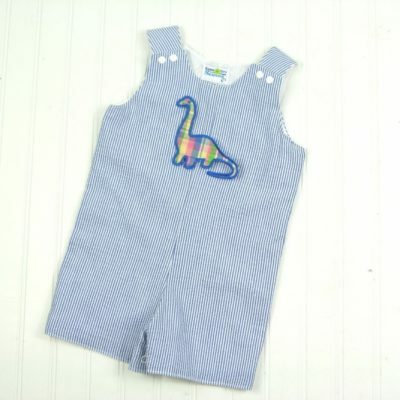 These little rompers are perfect for special occasions, or every day. They’re easy to care for so he can get plenty of wear out of it! OPTIONS: You can order the outfit with the fox, or add a name, or add initials. The thread color and font you select would be for the name or initials embroidered on the outfit. To get the outfit with the fox only, select none for thread and font. HANDMADE in USA: Each outfit is handmade from fabric in Columbia, SC. That’s what allows us to customize a handmade outfit just for you! Your purchase helps some amazing people on our small team provide for their families, so thank you!